I’m deep in editing-brain this week. Rather than leave you blogless, I thought I’d regale you with an old, semi-autobiographical short story that I wrote when I was first getting my fantasy legs under me. Without further ado, here’s the beginning of Salamander in the Basement (unedited, so I apologize in advance for any typos). There was little to recommend the long drive home. “Come home for Easter,” Mom said. “I need you to clean out the basement.” Perhaps she’d known the task would attract me as the fetid odor of skunk cabbage blossoms attracts carrion-hunting flies. The dark, moldering depths of the basement were below the house but accessible only through the outdoors. The dirt floor was more dust than dirt. Inside were boxes of mildewed books, discarded garments, garden tools, ice skates—who knew what I’d find down there. When I was younger, the basement had been a cool refuge from the heat of Tennessee summers. I would step outside and the humid air would surround me like the fog it almost was. But the basement was a rare refuge. Only on the hottest days would I trade grass for dust, sun for the dim, uncovered bulb with its dangling metal bead string. Mostly, the basement was Mom’s domain. Oh, we’d keep things there—winter clothes would be engulfed in black plastic trash bags and would descend to the depths where Mom stashed them away in some odd corner, stacked on wooden pallets to be off the dirt. Bushel boxes of apples and oranges were carried down by grudging children to chill in the cool, bowls of the fruit carried back up to the house even more grudgingly. Only Mom would go there to putter, to shift the bags and boxes. “Do you have a copy of The Plague?” I’d say, “I need it for school.” “Of course,” she’d answer. “Do you need it right away?” Invariably, the answer would be yes, and down she’d go to rummage, returning an hour or more later, dirt-smudged but triumphant. The book would release its basement mold slowly, missing the dark. Once or twice we got hints of the basement’s malevolence. A cat would disappear for hours, only to be discovered at meal time meowing at the inside of the locked door. And I would dream about the deep, dark space sometimes. About the walk down the hill outside the house to the raised doorway, so hard to lift a lawn mower through. In my dream I’d descend as I’ve done a thousand times…but this time when I stepped off that last stone I wouldn’t hit bottom. Falling, I’d wake. But everyone dreams of falling sometimes. Five days later I was home. “I can only stay until Monday,” I told her. Only four days. I wouldn’t be able to clean the entire basement in that time, but at least I could make a start at it, shift a few boxes to make room for more, throw out this and that. I descended that first afternoon, but the piles were daunting and precarious to my tired hands’ touch. After a bag of winter clothes fell on me from behind, I gave it up and spent the evening frogging instead. We drove to a nearby pond and shone my flashlight on courting amphibians, their neck pouches ballooning as they floated and called from the center of the green, virile pond. The basement was forgotten. Stay tuned for part two, coming in a couple of days…. Good start, looking to see were this will lead. Actually, this a question: how do I “order” Salamander in the Basement series? 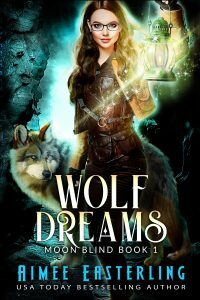 The first book in Aimee Easterling's Moon Blind series combines science and myth in a tale of prehistory, pack, and peril. 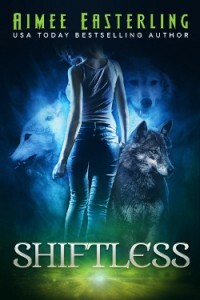 Terra is shiftless --- a werewolf uncomfortable in her own animal skin. From the reviewers: "Good choice for Patricia Briggs fans," "Exquisite worldbuilding," "This world lives and breathes."